‘Its polemic is potent’: James Varney writes on a science fiction performance about structural Islamophobia by Outside the Frame Arts. Hafsah Aneela Bashir in Cuts of the Cloth at HOME, Manchester. Image: Outside the Frame Arts. Cuts of the Cloth is science fiction. 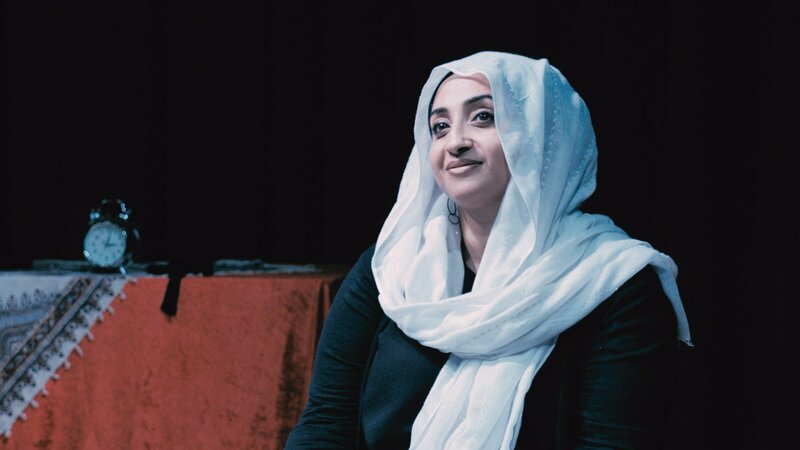 In an unspecified future, a Muslim woman is kept in a human museum, as a resource in a governmental programme for warning against the dangers of ‘Islamisation’, radicalism, ‘Islamist ideology’ and other vague but threatening-sounding words used to pigeonhole British Muslims. Hafsah Aneela Bashir plays a woman reduced to an exhibit number. In whatever ‘present’ we inhabit together, she is placid, as if wiped clean – calmly saluting peace like an automaton. As she recounts her stories, ostensibly of warning, we see the passionate, human woman she used to be. As a metaphor, Cuts of the Cloth is conceptually strong; programmes of community intervention, or ‘safeguarding’ in the UK as part of its counter-radicalisation strategy, are peddling shame and oppression in the guise of keeping us safe. The show’s free sheet unambiguously targets the government’s Prevent strategy. Bashir shows us the consequence of the way the UK is treating its Muslim communities is a puppet of a woman: politically streamlined, deprogrammed and separated from family and principles. It’s unsettling to see her wheeled out, primed, predictable, here to teach us a lesson. This is a show I wouldn’t have thought of as belonging in the main space at HOME. Which I think says more about my disdain for Theatre 1 than my thoughts about this show. I am prejudiced against HOME’s Theatre 1. Which I think is a result of the majority of the work I’ve seen here taking that space for granted. It seems natural that a Chekhov gets to sit hefty on a big stage, that translations of Jean Genet and big-name new American writers get seen up there. It’s a space that looks a bit like Isengard out of Lord of the Rings – it’s steep and dark and austere. It feels very shallow, which is a success in terms of making the stalls feel nearer to the stage but there’s a flattening effect too, as if the plane of the front of the stage is a cinema screen rather than empty space with people behind. I’m used to seeing work that has as least something old about it here. With Cuts of the Cloth, I’m surprised that it’s untrivial, and that it’s overtly political. Cuts of the Cloth is unguardedly angry about the contradictions between how the UK (and Europe) conducts itself and how it attempts to come across. And actually the hugeness of the space works to its advantage – it becomes sterile. Bashir’s character is handled needlessly cruelly at the hands of a larger force, and having her speak to us from a large, mostly empty stage puts the focus on where those forces have pushed her. It’s a small show (you can count the production team on the fingers of one hand) but it holds itself with a confident heft of its own. It belongs on this stage. I want to see small companies put on big stages – that’s the sort of thing I live for, but I’m still surprised by it. When I enter a theatre, the less I can take for granted the better. Dramaturgically, Cuts of the Cloth has a lot going on. The timelines of the individual stories which led to the protagonist being detained and brainwashed are unclear to me, and feel a bit disconnected from each other and the present. But when Bashir’s writing is clear, its polemic is potent. And the sci-fi framing does what all good science fiction does; the real story is in the past, which is to say our present. Bashir’s protagonist is detained and searched at border control, her students are investigated for having conversations which are too political. The metaphor is strongest when it bleeds away and we are no longer in the future, but are left with the account of a present-day British Muslim woman. Cuts of the Cloth was on from 18-19 January at HOME, Manchester as part of Push Festival. More info here.